i want to paint my house so that it changes color with temperature and humidity. this is as close as i can come in published articles. Shopping for a car will never be the same as scientists have developed a new form of auto paint that changes color with the touch of a button. 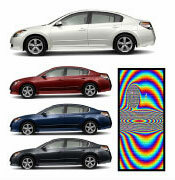 This revolutionary new paramagnetic paint is a technical wonder and is viewed by Nissan and other auto companies as an amazing innovation that would draw huge traffic to dealerships and will make it easier for consumers to get the exact option level they want on a car without the sacrifice of their favorite color. Research with this new science of special light reflecting coatings has been going on for years and there have been several different approaches used to achieve the effect but recent breakthroughs have taken it out of the laboratory and into a real commercial product for large scale applications. The coatings are perfect for an automotive application because a continuous small magnetic charge is needed to keep the desired color active and the driver also has the ability to turn off the system at which time the vehicle turns back to its default color of white. The coating has the ability to reproduce the full spectrum of colors and can change to a specific color in about a second. The actual materials used in the process are not expensive and are non-toxic. A special hard clearcote is used to seal and protect the surface and testing has shown that the color consistency of the finish is uniform even with the sharp creases and severe bends utilized in the exterior of automotive panels. 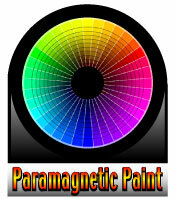 With progress continuing on current levels paramagnetic paint could make it’s appearance on some models by 2010.
there’s also thermochromic paint. and these guys seem to have the market boxed. and these guys.